This week the coalition-installed Iraqi regime creaked under the pressure of Sunni Islamist insurgency, Gove stepped up his ideological war in British schools and multi-millionaire JK Rowling conjured up an argument for the austerity union. Suki Sangha argues that while the news from Britain never seems to get any better, a Yes vote allows us to make our own headlines. Sunni Islamist militias have captured Mosul, the third largest city in Iraq, bringing the country back into a state of open civil war. It is 11 years since the invasion of Iraq and 13 since the beginning of the ‘war on terror’- a war which for so many people of my generation marked that moment in time when we became internationalists. We saw the skies of Baghdad light up from the bombs sent down by the British Government. We saw the effects of the depleted-uranium bombs that were dropped over Fallujah. At school we were taught a false narrative about Britain’s role in the world. A story which teaches children of the great adventures made by this so called “great nation”. We were taught about kings and queens and of far-away places, but missing from these discussions is the truth about the global theft, fraud, violence and murder of Britain’s imperialist history. A British empire which is responsible for the suffering and death of millions of people across the globe. Britain has blood on its hands and the blood never dries. JK Rowling’s support for Better Together is a stark reminder of the detachment of those who have wealth from those in working class areas up and down Scotland who are tirelessly campaigning for a yes vote. Missing from Rowling’s support for a ‘united Britain’ was a discussion about poverty, inequality and democracy. Britain is the 8th richest country in the developed world and one of the most unequal. Rowling contributed £1 Million to the claim ‘UK OK’. David Cameron and his minion Michael Gove want to instil “British values” into British schools. They want to teach our children about ‘freedom’, ‘tolerance’, ‘respect for the rule of law’, ‘belief in personal and social responsibility’ and ‘respect for British institutions’. Let’s address the hypocrisy head on. Freedom – British politicians want to preach about freedom when our foreign policy is directly responsible for the curtailing of freedom for people the world over. Respect for the Rule of Law – the concept will be peculiar to anyone who has lost a loved one through police brutality or murdered whilst in police custody. Belief in Personal and Social Responsibility – at a time when MPs continue to fiddle their expenses and where bankers and chief executives walk away with millions in bonuses. Respect for British Institutions – respect for governments we didn’t even elect. Respect for decisions made by a cabinet of millionaires and ratified by a mighty ‘House of Lords’ who have not the faintest idea of the daily struggles of ordinary people. As a woman from an ethnic minority background I am being asked to choose between a Scotland which I know will welcome the contribution of those who choose to migrate here and a Britain which I know scapegoats migrants and ethnic minorities. As a young trade unionist, I am being asked to make a choice between a Scotland which we can shape and a Britain in which every mainstream party proposes an agenda of cuts and further curtailment of worker’s rights. If being better together means more austerity at home and war abroad then we demand better, we deserve better. Voting yes in the independence referendum is not about nations and borders. It’s not about unrealistic expectations and socialist utopias. There is a reason why thousands of people are for the first time being inspired to get involved and participate in politics. It’s the fact that at the very heart of this debate about Scotland’s constitutional future is the idea that ordinary people shape politics. The news from Britain never seems to get any better. A Yes vote allows us to make our own news. 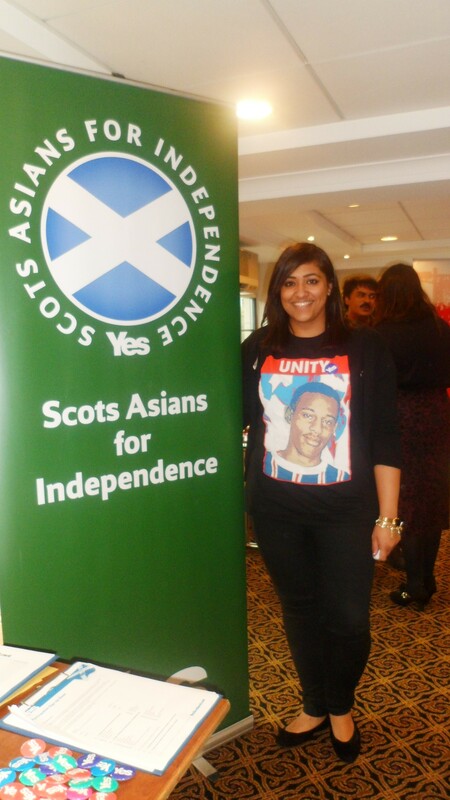 Anum Qaisar’s realisation that independence is the only way for Scotland comes at a very significant time as it is now only 100 Days to the big day on the 18th September. A very intelligent young woman, she contributed regular columns in Awaz newspaper promoting the advantages of staying together through Muslim Friends of Labour of which she is the General Secretary, or at least she was until yesterday, as many of you will have come to know through the Sunday Herald, when Anum wisely decided to walk over to the Yes camp leaving behind Labour’s the lack of vision over the subject of independence; a frustration she could no longer tolerate. 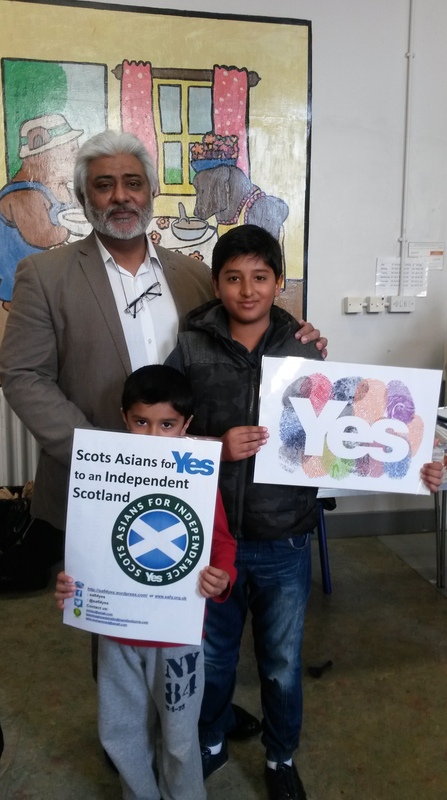 I know Anum’s father well who is a successful businessman and a close friend of Anas Sarwar’s father. A law graduate who worked as an interim for Anas’s constituency office, Anum, I am very sure, was well placed for a very bright future and a career as a labour politician; she had a lot going for her. But she sacrificed all that because she could no longer fight her conscious. She changed her mind. It was her growing dissatisfaction at Labour’s continuing failure and lack of willingness to return to its core values of social justice and equality, the very principles upon which it was formed. Indeed, no one can disagree with her. New Labour abandoned its mission statement as soon as Tony Blair in his slick city attire grabbed the reigns, taking the country into two illegal wars and one of the biggest financial crisis this country has witnessed. A party created for the working man yet it failed to tackle poverty that today it is our misfortunate to witness hand-outs and food banks at our very own door step as more and more families, including children, go to sleep hungry. Labour has traded its core values for securing more power in Westminster. In fact Anum describes as “toxic” the direction in which the UK Labour Party is dragging its Scottish counterpart in. However, there is one particular thing she has said which is very crucial and at the heart of her realisation to exercise her right to change her mind. It is her desire to revive “the very soul” of the Labour Party by removing it from the UK Labour Party. Herein lies the very significant need for consideration and contemplation for every Scottish Labour member to ponder over. If they wish for Scottish Labour to be an independent party working for the Scottish people then they must contemplate its future and start shaping its own unique destiny based on a Scottish identity and the ideals and wishes of the people of Scotland. Scottish Labour members must also like Anum Qaisar make the bold and courageous decision to think of Scotland, their country, and its future. They have to realise the survival of their party and its future or lack of cannot be separated from the question of Independence. It is time for them to think beyond what they can do for Westminster and instead rather what they should be doing for Scotland. I know many labour voters who will be voting yes in the referendum without severing their affiliation with the party. I also know of some labour members who in public have to sell the party line but in private they say they will be voting yes! Mr Obama’s thought that a United UK would serve America’s interests better makes one wonder-perhaps he doesn’t realise we are trying to serve our own interests better, as the First Minster brilliantly said the US can have two good allies after independence. I would ask everyone to welcome Anum and hope others like her will change their minds too whether openly or secretly, as long as they vote Yes, and we look forward to welcoming them too. Devolution is not the answer for Scotland, INDEPENDENCE IS!! If you were a black South African living in apartheid-era South Africa and transported forward in time to 21st century South Africa you would be forgiven for thinking the same regime was still in place just by looking at the relentless poverty around you. The great failure of Mandela and the ANC was their inability to grasp that racism and segregation was only part of the problem. What had to change, in order to help eradicate poverty in South Africa, and crucially what did not, was a different economic model to the one championed by F. W. de Klerk’s government. This explains why so many South Africans still live in abject poverty despite years of affirmative action and the dominance of the ANC over the political landscape. Replacing white European leaders with black South African leaders has not changed anything economically for ordinary men and women in the Rainbow Nation. Gandhi understood in his quest for Indian home rule that it was not enough for the British Ruling class to be replaced with an Indian ruling class if nothing was going to change for ordinary Indians. He envisioned a new political and economic system, something different to offer the people, otherwise what was the point? What was the benefit to the people if all that changed was the colour of skin of the politicians? It is imperative that the YES movement understands this point. Full democracy is worth the fight for Independence by itself. Few things are as precious in a well-functioning State as a political class that is directly accountable to its people. However, the economic model we use in an independent Scotland will be just as important. Robin McAlpine of the Reid Foundation has realized the importance of this and produced a brilliant vision of what the future of this country can be. The SNP have produced the White Paper demonstrating their vision of Scotland post-independence (I hope The Scottish Labour Party will produce a document if we get a YES vote). Both of these blueprints offer a more socially democratic alternative to the neo-liberal agenda of the Westminster parties. Why is this important? The neo-liberal experiment, with its relentless privatisations of public services, has been a complete failure. Specifically, it has been a failure for the majority of the population. The top 10% of the wealthiest in society have done extremely well out of this system and when the next recession hits, those people are always able to move their wealth out of the country. The UK is not a well-functioning state. We are now the 3rd most unequal developed country in terms of income inequality; we have the 2nd lowest minimum wage in the developed world, one of the least generous pensions in Europe and some of the highest childcare costs. According to the Scottish Parliament’s Welfare Reform Committee there has been a staggering 400% rise in people using food banks in 2013/14 compared to 2012/13 in Scotland. The Westminster Government’s reaction: denial of the problem. Societies with high levels of inequality are not known for being pleasant, harmonious places to live in. On the contrary, inequality breeds anger, often at other groups of vulnerable people who are not to blame. In a brilliant set of experiments in India, low caste and high caste children were asked to solve puzzles, with monetary rewards for success. When they were asked to do so anonymously, there was no cast difference in performance. But when the low caste and high caste were in a mixed group where the low caste individuals were known to be low caste (they knew it and they knew that others knew it), low caste performance was much lower than that of the high caste. The experiment highlighted the importance of social perceptions: low caste individuals some-how absorbed into their own reality the belief that they were inferior – but only so in the presence of those who held that belief. To put it another way: people act as they think the society they live in expects them to act. What we take from these experiments is the relentless attacks on the poor and the vulnerable only lead to more poor and vulnerable people. As well as the questionable morality of treating people this way there are sound economic reasons why this is counter-productive to a well-functioning society. The Nobel Economic Laureate, Joseph Stiglitz, has emphasised in his work the importance of low levels of income inequality and why this leads to a stable, well performing economy and societies that are less divided. Independence gives us an opportunity to create a better country and economic model, one in which we treat people better than we do now and be financially better off. In Scotland we have the talent, vision and drive to build a better country. The scraps of devolution only limit and prevent us. What is missing is full powers in our own hands to achieve this. All we have to do on the 18th September is vote YES. Too wee, too poor, too stupid? Don’t think so! Scotland truly has the capability to be an independent nation. In the last five years every Scottish citizen has been £1600 better off than the UK as a whole. For the last 33 years Scotland has generated more tax per head than the rest of the UK Scotland has a lower fiscal deficit than the UK – averaging 7.2% of GDP compared to 8.4% for the UK as a whole over the past five years. Scotland is the 14th wealthiest nation in the OECD club of developed nations. Scotland is the top location in the UK for foreign direct investment outside London and the South-East of England. Scotland’s exports total £73.6bn a year EXCLUDING oil production. Scotland’s food and drink industry turns over more than £13 bn every year. Our life sciences sector is one of the fastest growing in Europe – the value it adds to Scotland’s economy stood at £960million in 2011, up 9% on 2010. Scotland’s tourism sector employs almost 200,000 people and contributes £3.1bn to the economy annually. Scotland has one of the world’s strongest higher education sectors. Scotland has 60% of the EU’s oil reserves, with the North Sea generating around £34.3bn in the next five years. There remains up to £1.5 trillion wholesale value of oil and gas in the North Sea, with production forecast to continue to the 2050s and beyond. With Obama entering the referendum debate, it is clear that Scottish Independence can have profound foreign policy implications. Independence gives us the chance to break with decades of militarism. This radical independence forum has been brought together to present the case for an alternative foreign policy that puts peace at the top of the agenda and rejects the legacy of war brought about by the US/UK ‘special relationship’. David is the editor of Spin Watch and has edited and authored several books specialising in propaganda, war and corporate power. He has been a regular guest on current affairs programmes discussing such issues. 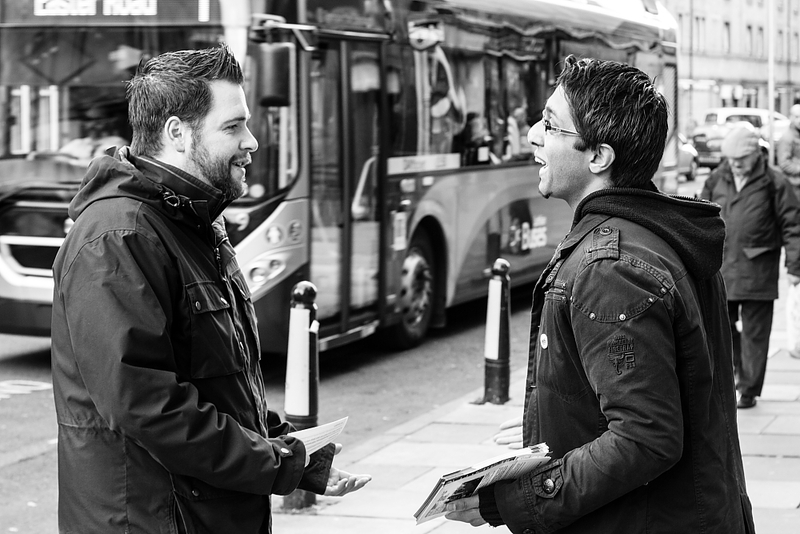 Jonathon is a co-founder of the Radical Independence Campaign and member of the Scottish Left Review editorial board.